Subscribe our YouTube channel for Accountancy, Economics and Business studies. 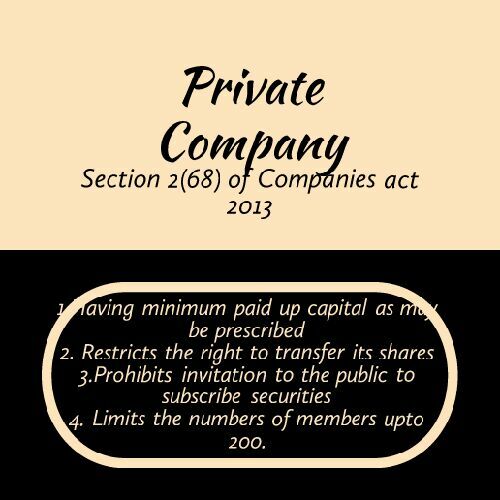 As per section 2(68), Private company means a company which has minimum paid up share capital as may be prescribed. Till now, no minimum paid capital is prescribed. It means that there is not any fixed amount of paid up share capital which is required minimum to form a private company. Private company in its articles restricts the right to transfer its shares. It means a person holding share of a private company can not transfer the shares to another person. Shares of private company cannot be traded on stock exchange. A private company can have maximum 200 members only except one person company. Employees of the company having shares of such company. Employees who were holding shares left the company and having still the shares of company. Apart from it , if two or more persons are holding one or more shares of private company, they shall be treated as single member of a private company. Prohibits any invitation to the public to subscribe any securities of the company. It means a private company can not invite public to subscribe its any securities. Securities means share, debenture or any other instrument. An important point is that a private can issue debentures to any numbers of persons. Condition is that company cannot invite public to subscribe its debentures. Members means shareholders, so number of members i.e 200 is limited to the shareholders. Further if two persons are holding 1000 shares of the company then those two persons shall be considered as one member. Section 14(1) clearly states that if a company alters its articles in such a manner that restrictions are also altered or not present longer in the articles, such company shall not be treated as Private company from the date of alteration. Hence, restrictions and limitations related to number of members, invitation for subscribing securities and right to transfer of shares must be present in Articles of association. Note: alteration means " to change"